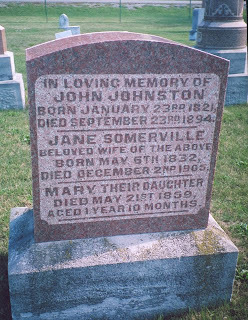 Today's tombstone is at St. Andrew's Scotch Kirk Cemetery, Quaker Hill, Uxbridge Township, Ontario County, Ontario at lot 35, concession 6. Church of Scotland. Parish Church of Annan (Dumfrieshire), Parish Registers for 1703 - 1855, Annan Parish Register microfilm #102307, Family History Library, Salt Lake City. Jane Johnston Ontario death registration #021118 (2 December 1905); digital image, Ancestry.ca (http://www.ancestry.ca ; accessed 29 September 2009), citing microfilm MS 935 Reel 122, Archives of Ontario, Toronto. Mary Johnston record of birth and baptisms Quaker Hill Presbyterian Church (photocopy) viewed at Uxbridge-Scott Museum. Note: Byers or Byres for Margaret Johnston's maiden name. Funeral cards can provide information about a person and the particulars of the death - the location and date and the place of burial. It might include some biographical information and a photograph. I do not have many in my possession. I did a search of some of the keepsakes that my mother had in some boxes. Until recently, I have not seen them locally but at more recent funerals or funeral home visitations, they have had bookmark sized cards with information and photograph of the individual but these are given out at the funeral home or place of visitation or service. In my search, last night, I only found two, but I know there are others around the house. The two that I found were for deaths on the Manitoulin Island. In a locality with only a weekly newspaper, these funeral cards are placed in stores so that people can be alerted to an upcoming funeral. Once when I was visiting my cousin Valerie, we had gone into Gore Bay to shop. There in one of the stores, we saw a funeral card. She mentioned it was for one of my cousins. Of course, the person was her cousin too. The first one I found was for Evelyn Jean Spry nee Wagg. I don't believe there is any family connection unless it is one of those, where it is a relative of a relative's spouse. Evelyn was the wife of the late Chester Spry. She died suddenly on August 4, 1967, at her home when only in her 47th year. The visitation and the service were held at Mindemoya United Church. Printed on the card, her place of burial is shown as Mindemoya Cemetery but in hand writing Cold Springs, Rockville has been added. There is the poem called "Comfort". There is no more biographical information about her. The other is for my uncle Ross Love who died in Mindemoya Hospital on May 2, 1989. Included is some of the basic family information. The funeral service and visitation were also at Mindemoya United Church. There was also a Masonic Memorial service. The poem "Crossing the Bar" is printed on the card. During the Greenwood Cemetery Walk conducted by Terry Govier. superintendent of Greenwood Cemetery, Owen Sound, we visited the grave of Captain Allan Henry Dixon. He is buried at Lot ID # G-NES18-7. Allan Henry Dixon was born in Sydenham Township on 23 August 1898 to Leslie Dixon (a weaver) and Edith Bigg. According to information in the tour booklet prepared by staff at the Owen Sound Marine Rail Museum, Allan went on the boats at age 1914 and by the age of 21 he had his captain's papers. Allen Henry Dixon was employed on the Grey Beaver and the R. Bruce Angus. Two of his border crossing cards can be found on Ancestry.ca. On 9 May 1941, he entered the United States at Rochester, New York with his occupation listed as seaman. On 13 June 1942, he arrived on board the SS Grey Beaver at Oswego, New York, with his occupation listed as mariner. On both occasions, it indicates that his fingerprints were taken. Was this because it was during the Second World War? He is listed as 6 foot 1 inch with medium complexion, light brown hair and grey eyes. His contact is his wife Beatrice Dixon who was living in Owen Sound. The Johnson Presbyterian Church cairn is in front of the few monuments that are in a fenced in area. The cemetery is five miles north of Annan on the Balaclava Road. A frame church was built on the Johnstone property in 1858. In 1920, it was replaced with a brick building. John Johnstone, son of William, who had originally gave the land, gave a bequest through his will to go towards the new church. In 1925, the church became a United Church. The last church service was 23 November 1969. Ken Kivell built the stone cairn to mark the original location of the church. He inlaid the slab of stone from the building that bore the name "Johnson Presbyterian Church". The cairn was dedicated on 6 November 1977. The September theme for the Graveyard Rabbits Carnival was a potpourri of writings by fifteen graveyard rabbits. To read them visit here. The October theme, due September 25, is funeral cards. I will have to dig through some boxes to see what I have.